Architecture History in Crochet Project has now begun with the first design choice from Exeter Cathedral in England. I will be working on this project throughout this year as I explore and be inspired by the amazing architecture of the past. I choose my first rose window from Exeter Cathedral in England due to the beautiful stone tracery and design as well it has various other unique stone tracery designs in and around this dramatic window. 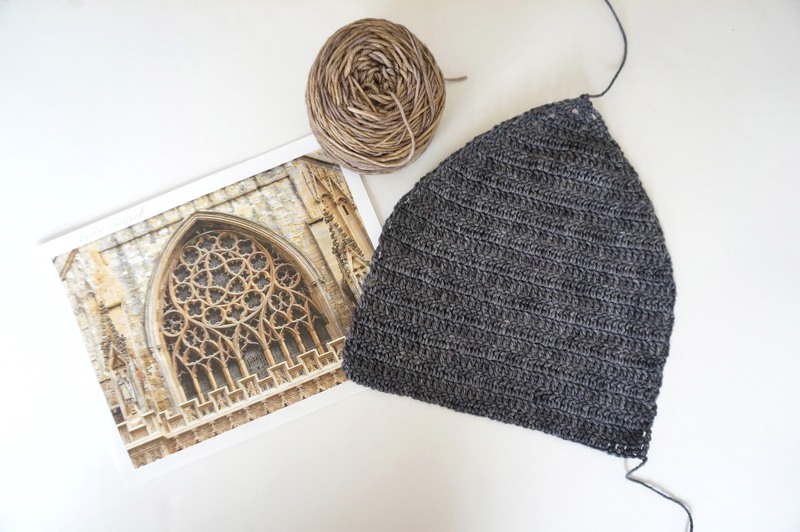 Follow me as I take a look and begin my Architectural Crochet journey into the windows of the past starting with a peek into the Gothic Inspired designs of Cathedrals. As you have seen in my previous designs this past fall and on my blog I have been working on many different scarf designs that include Rose Windows with their stained glass, stone tracery and other Gothic Architectural features of the past. With this project I will be going a different direction than scarves which will not only be a surprise to you but myself as well. My plan for this project is to use one of my favourite ways to design by starting with an inspiration and seeing where it takes me. I know it will be a much bigger piece to wear than I usually do or perhaps various pieces that will go together on a wall, I will decide this later once I see how each design piece will work together or perhaps better with space between them. Some of the other Cathedrals that I will be adding to this project next are Amiens Cathedral, Notre Dame Cathedral, Laon Cathedral all in Paris for the Gothic Style Architecture began in France in the 12th century and lasted until the 16th century. Many other styles of Architecture will also begin so show themselves in my future designs so come along and see where I go on this new adventure. The first piece you see here is the background of the stained glass rose window from the outside looking in. The hand painted merino wool by http://www.sweetgeorgiayarns.com gives the perfect mix of grey to mimic the rod iron on this very detailed stained glass window from the outside with the various grey tones. I will be using a combination of yarns from various companies to complete each piece to achieve the colour tones needed. I am excited to see where I can take this project, it has been playing in my mind for a while now and it is time to let it evolve as it wishes. This is a very freeing way to design that I like to use sometimes to see where my creative juices flow. Of course you can not design everything this way, it doesn’t work with everything, but it can really boost your creativity to new levels that you didn’t know you were able to achieve. Try it sometime to see where you can take a design or project and see where it goes and where it takes you. Like going on a little trip, a new adventure that keeps you fresh and eager to continue in your design path. ← Thank you to two amazing bloggers who featured me! Thanks with all my heart!